If the sum of two angles are 90o then the angles are said to be Complementary angles. Each one of these angles is called the Complementary of the other. Here ∠POR is said to be complementary angle of ∠ROQ and ∠ROQ is said to be complementary angle of ∠POR. If the sum of two angles are 180o then the angles are said to be supplementary angles, . Each one of these angles is called the supplementary of the other. Here ∠POR is said to be supplementary angle of ∠ROQ and ∠ROQ is said to be supplementary angle of ∠POR. If the sum of two angles are 360 then the angles are said to be Conjugate angles, . Each one of these angles is called the conjugate of the other. Here ∠POR is said to be conjugate angle of ∠ROQ and ∠ROQ is said to be conjugate angle of ∠POR. Two angles having the same measure are known as congruent angle. In the above figure ∠AOB & ∠POQ are congruent angles. 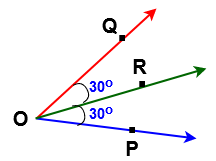 A ray which divides an angle into two congruent angles is called angular bisector. In the above figure ray OR is called angular bisector of ∠POQ. Thanks for reading this article. 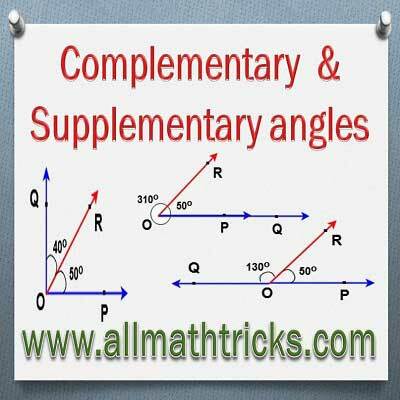 I Hope you liked this article “Complementary and supplementary angles meaning with examples”. Give feed back and comments please.